Newcastle United endured a terrible start to the Premier League season, as they didn't pick up a win in their opening ten matches. Things were looking bleak even when the difficulty of their opening fixtures had been taken into account. Then when a key player in Shelvey was injured, there was more doom and gloom about their up-and-coming prospects of picking up any points, with the main man in the middle missing. When Rafa Benítez signed Ki from relegated Swansea in the summer transfer window, a large majority of Newcastle's following thought he had just been signed to become a makeweight for the squad's numbers, especially as the club had a stingy budget to work with. When questioned about the signing, he stated that he was happy to be bringing someone who has a wealth of international and Premier League experience which would prove to be vital for the season ahead. Few would have expected those words to have been anything more than pleasantries. This was due to it not being the Spanish playing style to play Shelvey and Ki together. This was despite the pair playing in the same team at Swansea. As this would leave the side open at the back and that is not the style of Rafa to be free and expressive. This is not to say Benitez doesn't like his teams to play good football from time to time but he is definitely the type of boss who drills his teams on having a good shape. As he sets the team up to be rigid when the need for being rigid is more paramount in games than being open. For this reason, Benitez was never likely signing Ki to rekindle some kind of midfield love pact between the South Korean libero and the balded bonced threader of needles. It is was only ever going to be a choice between Ki or Shelvey in Rafa's mind for one of two central midfield roles. The only way that the Swansea bromance would be rekindled would be if Rafa's hand was forced through injury or suspension and it worked so well that he had no choice to keep the team the same. When Shelvey was injured there was a small modicum of panic from Newcastle fans, the only reason the levels of panic were so small is that the doom and gloom were starting to set in among a section of the Newcastle support due to the difficult start. A lot of others just seemed resigned that Newcastle would be a bit hopeless this year, and that Mike Ashley had sole Rafa down a river without a boat never mind the paddles. However, it can be seen as no coincidence that ever since Shelvey has been out through injury, and Ki has now been in the team that the results have suddenly improved. Shelvey's game is all based around lobbing beautiful glory balls forward that fast attackers can get onto by sprinting through turning the defence and popping the ball into the net. Last season Newcastle had Dwight Gayle to do the running around up top, and he may be of limited quality in the Premier League but he is definitely more mobile than both Joselu and Salomon Rondon are. So when Shelvey looked to ping a lovely ball forward, he had Gayle there to chase it down, but this season he has had Joselu or Rondon to chase it down and they aren't exactly the paciest two strikers in the league. 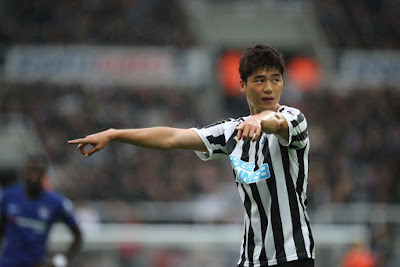 Ki, on the other hand, is a similar player to Shelvey, in that he also likes to be on the ball spraying passes about and trying to control the game from the middle of the park, the slight difference comes from the fact that he is more likely to be seen playing shorter passes but is the type of midfielder that will keep your team in possession and keep the game ticking over. The fact that Newcastle now has two big lumps as their out and out strikers instead of a willing runner is what has benefited Ki's game and not helped Shelvey's this season. With the types of attackers Newcastle is now utilising, Ki has become more effective for the team which has shown in the positive upturn in recent results. If Ki can keep this form up he might even get a prolonged run in the team by keeping Shelvey out, but if Newcastle manages to sign an out and out forward with some decent pace come the winter transfer window then that would help see the best of Shelvey again. Ki has been excellent in the last three games and deserves his place in the squad but Shelvey has been the victim of circumstances this season I feel and no matter how many brilliant balls he pings forward, he is still pinging them to the likes of Joselu and Rondon who most of the time couldn't hit a cows arse with a banjo. Let the Ki love in commence, and we think he should keep his place in the starting 11 for the visit of West Ham in at the weekend.